MASS etiquette suggests Catholics turn off or silence their mobile device before entering the church, but that rule doesn’t apply to Canadian priest Fr Francis Ching. 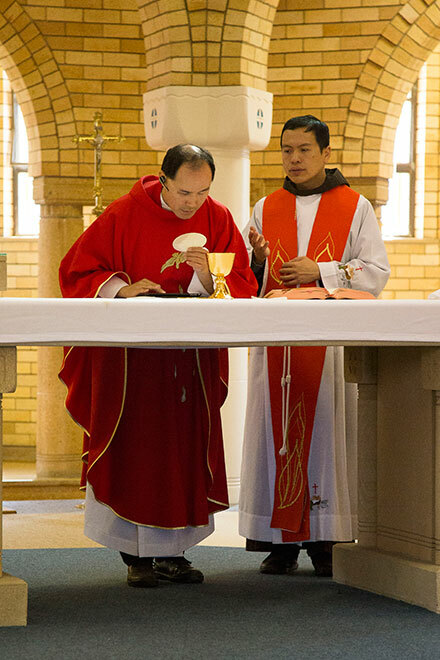 Every time the 45-year-old Chinese-born priest celebrates Mass, or when it’s time to say his prayers of the Office, the iPad is on and right at his fingertips. Without it, Fr Francis couldn’t fulfil his priestly duties because as a legally blind priest, he can’t read a Missal or his breviary. So Fr Francis relies on his iPad and an ear bud to translate text – like the Eucharistic prayers or the Gospel reading – to speech. Using the iBreviary app, Fr Francis is able to touch sections of text which is then “read” to him on his ear bud. He has done this since 2009 and it has become his “new normal”. The technology is not perfect, so before every Mass, Fr Francis explains to his congregation that if he says anything wrong, it’s the iPad’s fault. Ching touches his iPad to listen and repeat the Consecration for the Mass of the Feast of St Thomas the Apostle at ACU Banyo. Witnessing one of Fr Francis’ Masses is nothing short of inspiring, and not just to see the Speech to Text technology in action. As a priest in a religious congregation founded in Canada that embraces the Charismatic Renewal, Fr Francis is also a passionate musician who plays the guitar and sings. When he offered Mass for the Feast of St Thomas the Apostle at the Australian Catholic University in Brisbane two weeks ago, he led the processional and recessional hymns with his guitar. Born in Hong Kong in 1972, the self-confessed “stubborn” priest was most likely born with glaucoma. His family first discovered his sight problems when he underwent a mandatory eye test in Grade One. A specialist revealed Fr Francis’ eyes needed to be operated on, but he was placed on a waiting list for three years because of his age. Following the operation there were “all kinds of problems” with both eyes and he eventually lost the central vision in his right eye. In 1986 he and his family moved to Canada, where his eyesight steadily failed over time. “Eventually I became completely dependent on my left eye, and the cataracts were treated with eye drops,” Fr Francis said. For a while he could cope with just drugs and medicine; he could study and read, and could still play soccer. 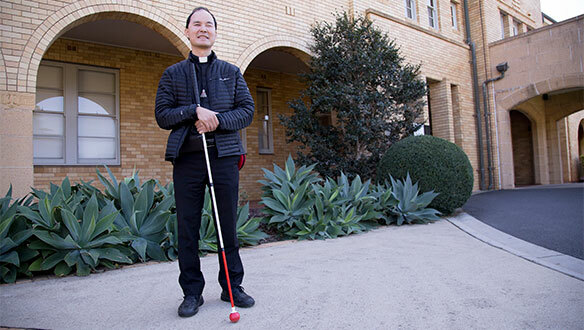 When he entered the seminary in 1999 following a “conversion experience” after walking away from his faith at university, his eyesight deteriorated but he still had some sight, and got by with a cane and a cap with a long brim. Losing nothing: “I lost my ability to read but I can do everything I did before.” Photo: Emilie Ng. But in 2009, four years into his priesthood, he completely lost the ability to read. “I think one of the lessons I learned is there is nothing I can do about it,” Fr Francis said. “Very early on, even before I had my first surgery when I was in Grade Four, I just had a sense that it’s going to be okay. “I think there’s a grace in God. “When I realised I can’t read anymore, there was a difficulty there, then someone came along, my spiritual director came around and said ‘Well, this is your new normal; you can’t go back, you can’t wait for it to come back’. For instance, Fr Francis’ priestly ministry involves full-time evangelisation work, including formation and training for a Chinese media charity, giving retreats, parish missions and workshops. 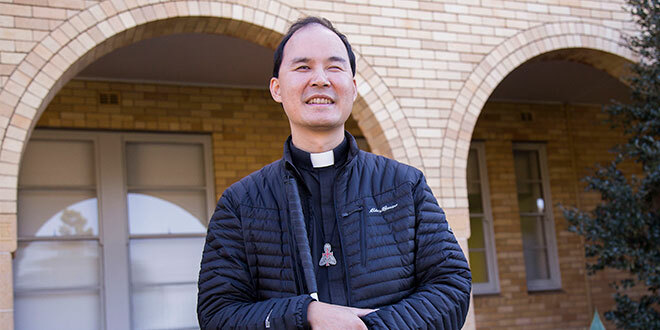 He is also the spiritual director for a Chinese Catholic community in Eastern Canada. His priestly ministry isn’t just limited to Canada, either. 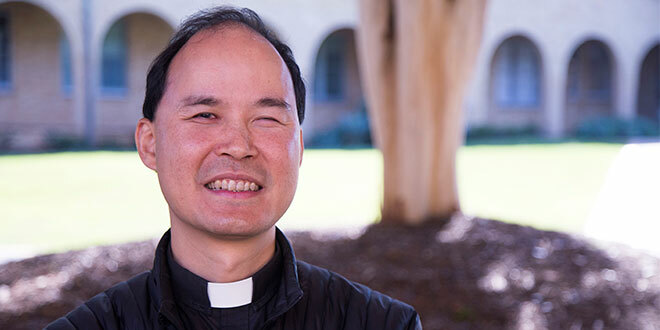 This past month Fr Francis has been visiting Chinese Catholics living in Brisbane, Sydney and Melbourne. He has a deep love and affection for Mary, who was one of the reasons he returned to the Church. He is proof that no disability can get in the way of building the Kingdom of God, but Fr Francis is also aware that he’s no (Marvel superhero) Daredevil. “The only thing that was troublesome was when I dropped something, I can’t find it,” he said. “That takes a lot of dying to myself. “I can’t do what I can’t do. “It’s amazing that actually, that’s essential for our spirituality. “A lot of people are stuck with sorrows, stuck with past hurts, stuck with the people around them not behaving, and they devote all their energy and time on that. “You can’t fix people, you can’t change people, so give it up. “There’s a lot of work that we have to do and we’re wasting our time and energy on things we can’t do. What is clear is that God wants Fr Francis’ priestly ministry to thrive, both in Canada and around the world, and if that means breaking the rules of etiquette, so be it. “I lost my ability to read but I can do everything I did before,” Fr Francis said. Strong faith: Fr Francis Ching. Photo: Emilie Ng.